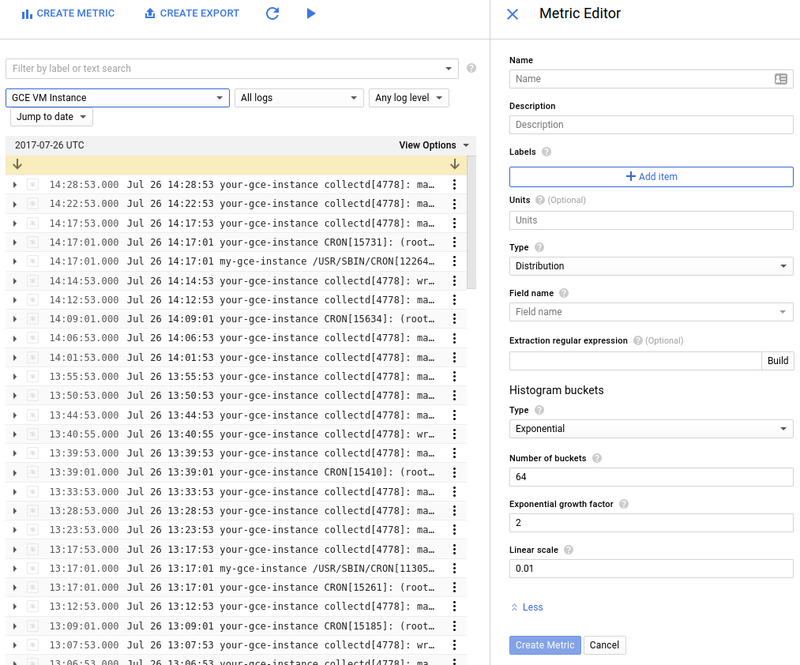 This page explains how to create distribution-type logs-based metrics using the GCP Console and the Stackdriver Logging API. Distribution metrics require both a filter to select the relevant log entries and a value extractor to grab the numeric value for the distribution. The value extractor is the same kind as is used for user-defined labels. A distribution metric records the statistical distribution of the extracted values in histogram buckets. The extracted values are not recorded individually, but their distribution across the configured buckets are recorded, along with the count, mean, and sum of squared deviation of the values. You can use the default layout of histogram buckets in your distribution or you can fine-tune the buckets' boundaries to approximately capture the values. For more information, see The user interfaces. Units: (Optional) For distribution metrics, you can optionally enter units, such as s, ms, etc. For more information, see the unit field of the MetricDescriptor. Extraction expression: (Optional) If Field name always contains a numeric value convertible to type double, then you can leave this field empty. Otherwise, specify a regular expression that extracts the numeric distribution value from the field value. The Build menu can be used to interactively build and verify the regular expression. More (Histogram buckets): (Optional) Clicking More opens a section of the form you can use to specify custom bucket layouts. If you do not specify your bucket layouts, a default bucket layout is provided. For more information, see Histogram buckets on this page. Some naming restrictions apply; see Troubleshooting for details. metricDescriptor: a MetricDescriptor object. metricKind must be DELTA. valueType must be DISTRIBUTION. Distribution metrics include a histogram that counts the number of values that fall in specified ranges (buckets). You can have up to 200 buckets in a distribution metric. Each bucket has two boundary values, L and H, that define the lowest and highest values covered by the bucket. The width of the bucket is H - L. Since there cannot be gaps between buckets, the lower boundary of one bucket is the same as the higher boundary of the previous bucket, and so forth. So that the boundaries don't fall into more than one bucket, a bucket includes its lower boundary; its higher boundary belongs to the next bucket. All bucket layouts can be specified by listing, in increasing order, the boundary values between individual buckets. The first bucket is the underflow bucket, which counts values less than the first boundary. The last bucket is the overflow bucket, which counts values greater than or equal to the last boundary. The other buckets count values greater than or equal to their lower boundary and less than their upper boundary. If there are n boundary values, then there are n+1 buckets. Excluding the underflow and overflow buckets, there are n-1 finite buckets. Linear(offset, width, i): Every bucket has the same width. The boundaries are offset + width * i, for i=0,1,2,...,N. For more information on linear buckets, see the API reference. Exponential(scale, growth_factor, i): Bucket widths increase for higher values. The boundaries are scale * growth_factor^i, for i=0,1,2,...,N. For more information on exponential buckets, see the API reference. For more information on explicit buckets, see the API reference. Linear buckets: Fill in the histogram bucket form as follows. Start value (a): The lower boundary of the first finite bucket. This value is called offset in the API. Number of buckets (N): The number of finite buckets. The value must be greater than or equal to 0. Bucket width (b): The difference between the upper bound and lower bound in each finite bucket. The value must be greater than 0. Bounds (b): A comma-separated list of the boundary values of the finite buckets. This also determines the number of buckets and their widths. Number of buckets (N): The total number of finite buckets. The value must be greater than 0. Linear scale (a): The linear scale for the buckets. The value must be greater than 0. Exponential growth factor (b): The exponential growth factor for the buckets. The value must be greater than 1. 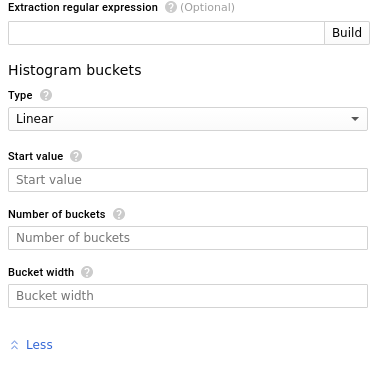 For more information about the buckets, see BucketOptions in the Stackdriver Monitoring API. Explicit buckets: Boundaries are listed individually. Your new metric appears in the Logs Viewer's list of metrics and in the relevant Stackdriver Monitoring menus right away. However, it may take up to a minute for the metric to start collecting data for the matching log entries.